A down-to-earth port city, Sète was planned and built in one go in the 1660s as the Mediterranean terminus of the ambitious Canal du Midi. The city still gets a lot of maritime traffic and is etched with waterways, which are fine for walks or cruises. 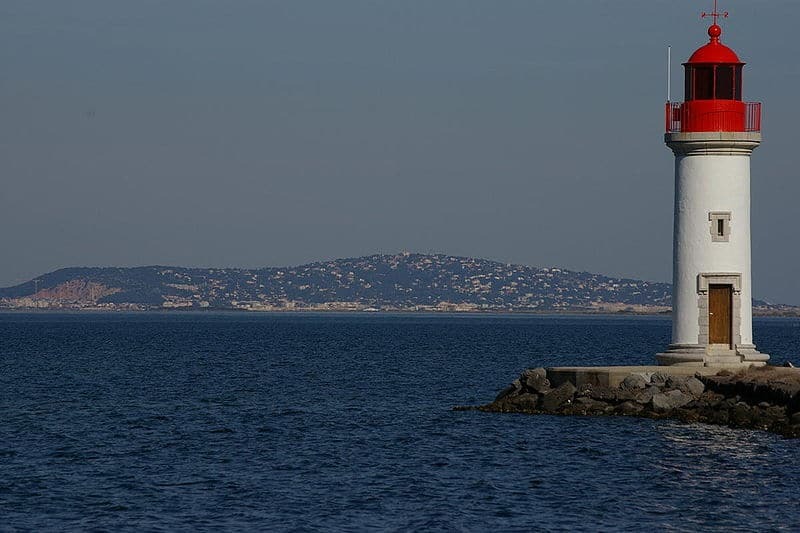 A roll-call of cherished French artists, poets and musicians, like Georges Brassens and Paul Valéry, were born in Sète. And their lives are celebrated with attractions like the Musée Paul Valéry, on a terrace over the water. If there’s an ideal time to book your trip it has to be August, when whole city turns out onto the quayside to watch the gripping water jousts that have been a tradition for 350 years. With its gridded streets, canals and bridges, the city has a streetscape that doesn’t really compare to anywhere in France. You could kill an afternoon sauntering along the quays, pausing every now and again to admire the painted houses and historic warehouses, and takingr lunch by the water. Canal Royal is the eastern culmination of the Canal du Midi, allowing craft to go from the Atlantic to the Mediterranean as early as the 17th century. See the statue of the jouster on the Pont de la Civette, and watch the fishing trawlers and pleasure craft come in and out of the harbour. 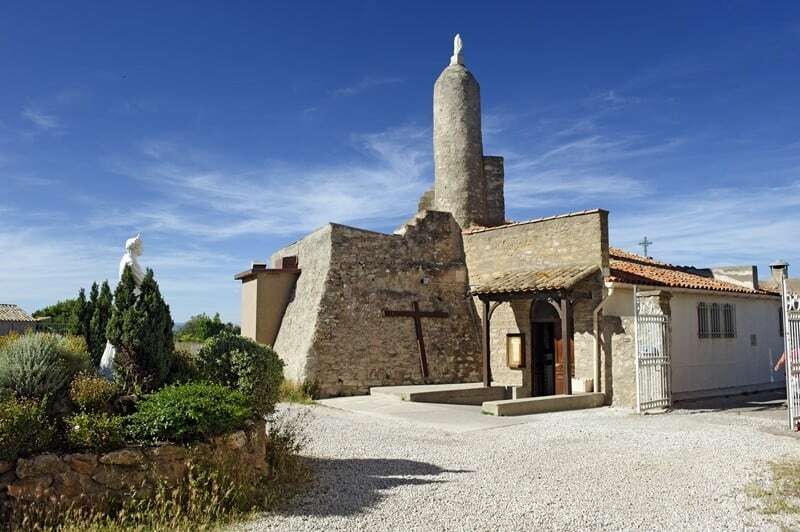 On a terrace near the top of Mont Saint-Clair, this museum is named after the acclaimed early-20th-century poet and philosopher Paul Valéry, a Sète native. The galleries cover everything from the history of the city to fine art: There’s an in depth account of the famous jousts, documenting every result since 1666 and displaying antique shields and lances. You can also pore over a special room for Paul Valéry, with manuscripts, recorded recitals of his work and rare copies of his texts. Afterwards soak up the views of the Mediterranean and maritime cemetery from the cafe on the terrace, or wander the gardens where music, theatre and literature events are held on summer evenings. 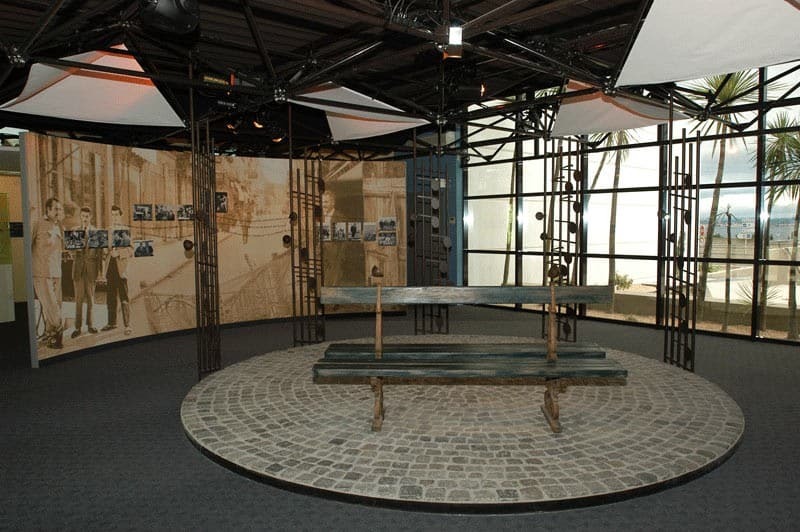 After perusing the museum named in his honour you could pay your respects at the tomb of Paul Valéry, in the very place he eulogised in his poem “Le Cimetière Marin”. The setting is what makes this sight, as the Maritime Cemetery is in a singular position, resting on a cliff-top over the deep blue waters of the Mediterranean. Valéry’s final resting place is actually under the Grassi name, which was his mother’s family. Another of Sète’s famous citizens interred here is Jean Vilar, a highly influential 20th-century stage actor and director, who turned the French theatre world on its head from the 40s onwards. Every August Sète honours its patron saint during the Fête de la Saint Louis. The centrepiece of this festival is water jousting, which goes down in the Canal Royal and involves two big guys facing off on platforms attached to crewed rowboats, using lances and wooden shields to knock the other into the water. The jousting tournament is box office, to the point where stands are erected on the quays next to the canal and the crowds run deep. 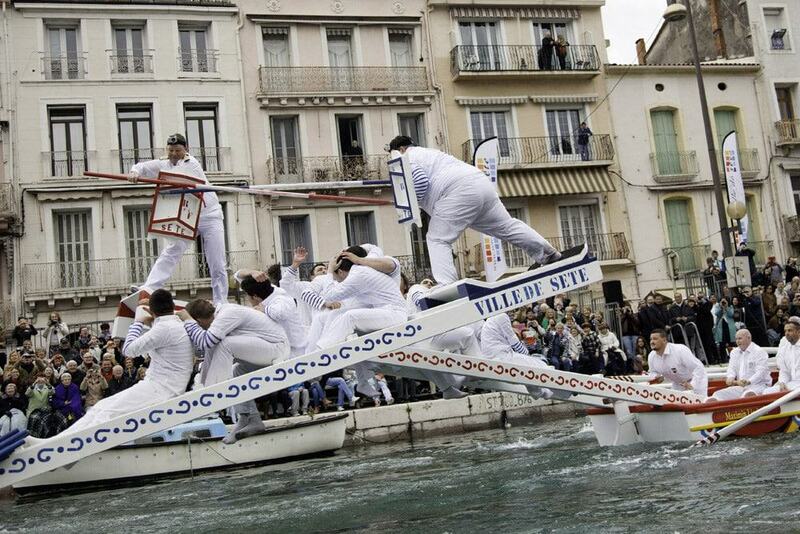 Competitors take part in a tradition that returns to the very roots of the city, as Sète’s inauguration was marked with water jousts in 1666. There are also all kinds of street shows and outdoor bars (known as bodegas). Another son of Sète who became a beloved cultural figure was the poet and songwriter Georges Brassens, whose career spanned the post-war years to his death in 1981. This exhibition devoted to his life and career takes on the challenge of commemorating things as intangible as songs with the help of a multilingual headset guide. 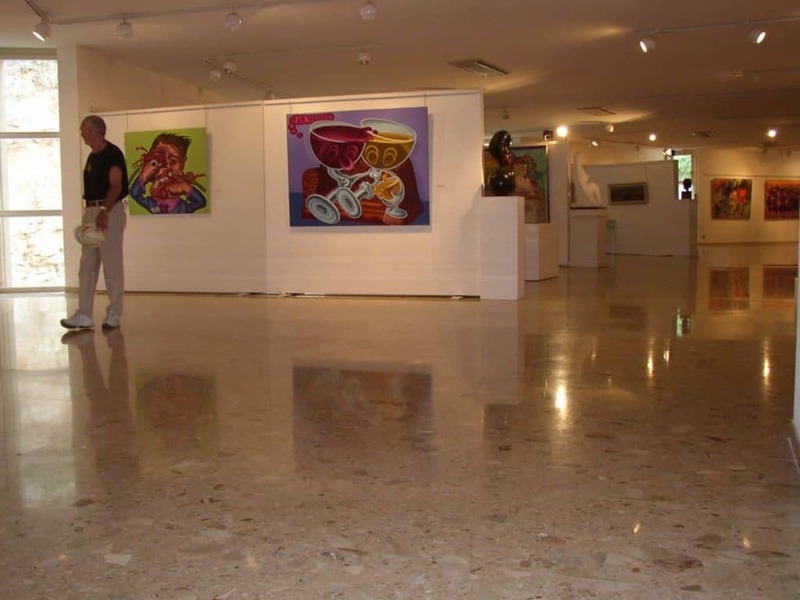 So as you make your way through these galleries, Brassens’ words and music are a constant presence. And if you’re a fan, you’ll get to know about his childhood, the writers that influenced him and the story behind songs like “L’Auvergnat”, “La Gorille” and “Les Copains d’Abord”. In an old waterside warehouse on the Canal Royal, the MIAM deals with “Art Modeste”. This is a bit like outsider art or naïve art: In essence this celebrates even the most mundane manmade objects, like Barbie dolls for instance, and puts them in a different context to give them a soul. The product tends to be either imaginative and whimsical, or at least challenging and thought-provoking, and comes in all formats, from video to sculpture. The temporary exhibitions are updated every few months and there’s a full program of talks and workshops. Fort Saint-Pierre was built near the entrance to the harbour in the 1740s to defend Sète against regular attacks by foreign navies. The fortress had a military function up to the end of the Second World War, before being converted into an extraordinary performance venue in the late-50s. At the start it was mostly for stage productions, but over time music has dominated the program. 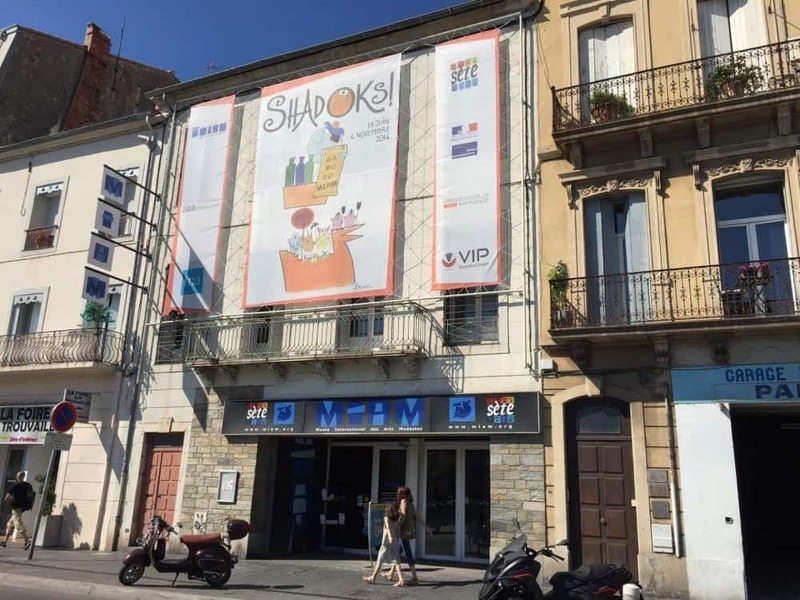 And whatever is on, whether it’s a touring artist or the festivals, Fiest’A Sète or Jazz à Sète you owe it to yourself to get down here. You can watch the acts and the sea at the same time, and it’s magical when the moon is reflected in the water. The slopes of Sète’s hill are almost precipitous in places, but that only makes the panoramas all the better at the 175-metre summit. If you’re not up for the walk then you can use public transport or drive. This mass was once an island of its own, and its sides are decked with villas and artsy ateliers in homes built for Italian fishermen. The western slopes meanwhile are wooded and serene, and good for rambles. At the top the views are almost unbelievable, and there’s a platform with benches where you can survey the port, canals and the Thau Lagoon. After battling to the top of the hill you may not be in the mood (or shape) to return to sea level so quickly. Something to divert your attention is this strange chapel that fishermen would frequent before voyages to pray in front of the Madonna de la Salette. The chapel, consecrated in 1864, is where a 17th century fort once stood, and integrates a piece of the bastion into its design. Go in to check out the vibrant modern frescos, which echo 20th-century religious murals painted by the likes of Cocteau, Foujita and Matisse elsewhere in France. Some of the fun of this landmark is getting there: The lighthouse is near the tip of the western harbour wall, the Môle Saint-Louis. This is 650 metres long and gives you a supreme look at the marina and its forest of masts, as well as Mont Saint-Clair. This path is as old as the city, and the beacon on the end isn’t much younger, dating to 1680. It was destroyed by German mines in the war but bounced back directly after and is open to visitors. You can ascend the 126 steps for elevated 360° views of the city, harbour, sea and commercial port. Beginning west of Mont Saint-Clair is a continuous 12-kilometre ribbon of golden sand, with no fewer than ten beaches awarded the coveted Blue Flag in 2016. These are set on a long sandbank, up to 1.5 kilometres in width, known as the Lido and there isn’t much here apart from ancient salt flats and vineyards. So the further along you go, the quieter it gets. But to earn all those Blue Flags the facilities have to be top of the line, and have toilets, showers, six lifeguard stations and equipment for people with disabilities. You may feel that you can’t completely understand Sète’s reliance on the sea until you’ve climbed aboard a vessel and gone on a little voyage. Something you’ll realise right off is that the city’s many bridges are surprisingly low from the water, and you may even be asked to duck occasionally! The warehouses and painted apartment buildings are a delight from the water, and there’s a running commentary in French and usually printed material for non-speakers. There are also specialised trips, like visiting the massive oyster and mussel beds in the Thau Lagoon. With the sea, Thau Lagoon and Canal du Midi you’ve got a big choice of things to do if you feel like taking to the water. This can be anything from a pirogue trip in the lagoon, or an open sea kayak adventure up or down the coastline. It’s also fine if you’re a newcomer as most of these experiences are guided. But if you are daunted by the sea, you can head up the Canal du Midi or try stand-up paddling on the buoyant, saline waters of the Thau. A big share of the people landing in Sète arrive by cruise ship and only have limited time to get their bearings and see the sights. So in those cases, or if littler legs aren’t ready for an afternoon traipsing around the city, the tourist train can be a worthwhile pick. 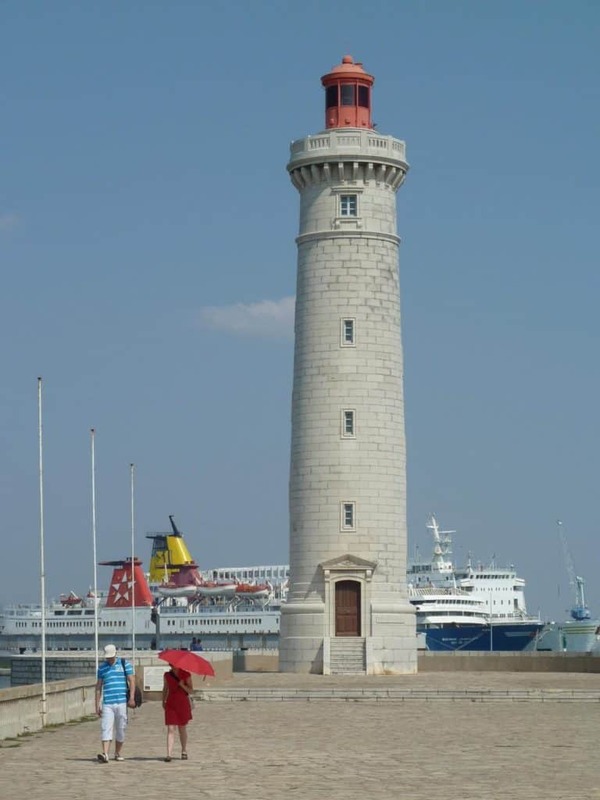 It departs from Quai Général Durand and weaves around the new commercial port and the historic one, as well as sights like the Théâtre de la Mer and the Saint-Louis Lighthouse. If you have a taste for fish and seafood then you’ve come to the right place. The Thau Lagoon, the largest and deepest in Languedoc, has been harvested for mussels, oysters, clams, winkles and sea urchins since antiquity. 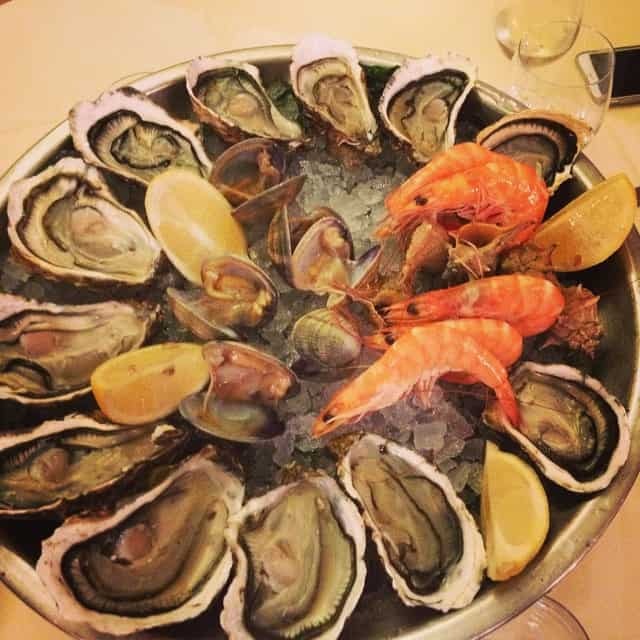 So your “fruits de mer” could not be fresher in Sète. From the sea comes monkfish, cuttlefish, bream, squid and octopus, which are stars or various authentic local recipes, like stuffed squid or traditional “tielles”, octopus pies that fishermen would take with them to sea.